What are the Best Turkey Calls for Beginners? What Kind of Turkey Call is Suitable for Beginners? The push button call is probably the simplest and the easiest to use out of all the turkey calls available in the market today. In fact, it’s so easy to use that many veteran hunters find it embarrassing to use one. However, I believe that a beginner hunter would benefit from using a push button call, if only because it will allow him to familiarize himself with the right sounds that turkeys make without worrying about how to operate the tool correctly. After all, you only need to push the button on the box and you can already imitate a turkey’s yelps and purrs. If you do decide to use a push button turkey call, be careful not to let it get wet or moist with dew. Many push button turkey calls get easily ruined when exposed to moisture, affecting the sounds they produce. I’ve heard that box calls are a favorite among novice turkey hunters, and I certainly understand the appeal. While it might be a bit more complicated to use than a push button call, a box turkey call produces sounds that are carried to farther distances. This means that you have a higher chance of attracting turkeys to your location because they could hear you from far away. A lot of box calls are made of wood, making them sensitive to rain and moisture. The good news is, there are manufacturers that produce waterproof box turkey calls which make the same quality of clucks, purrs, and yelps that a regular wooden box call does. Because box calls are usually operated using both hands, you might find it a bit tricky to use if you need a free hand to operate your weapon. Still, I think the box call is a good starter call to practice on before moving to the more complicated ones. Slate turkey calls are often shaped round (hence the term “pot call”), and are made of either slate, glass, ceramic, or any other material that produces turkey sounds when partnered with a striker. Many strikers are made of wood, but they could also be made of carbon or other materials. I find that slate turkey calls are harder to use than a push button turkey call or a box call, but I love how you can make more different turkey sounds with it. Depending on the angle or direction you use your striker, you can produce either a high-pitched yelp, a soft purr, or a frantic clucking sound that would send turkeys running to your direction. If you want to make the most of a slate call, I recommend investing in one that has two or more surfaces. For example, you can buy a slate call that has a glass and a slate surface, so that you can alter your turkey call depending on the situation. 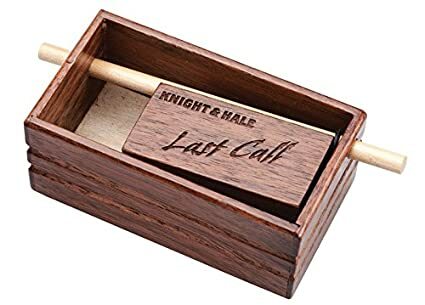 The simplest turkey call in my list, the Knight & Hale Last Push/Pull Turkey Box Call is, predictably, the easiest to use. All you need to do is push the tip of the stick outside the box and you’re good to go. 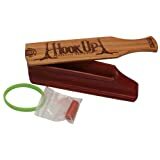 I think this is what makes it such a good beginner turkey call if you just want something easy to use. Unlike generic push button calls, however, this product is handcrafted with walnut wood, with a new and improved design to make it easier to use and tune. Despite its simple design, it can produce realistic turkey clucks and purrs for a wide variety of calling situations. Of course, because it is made of wood, it’s susceptible to damage when it gets wet. It’s also pretty big, so it’s a bit of a trouble to carry around, compared to other turkey calls. Very simple and easy to use—just push the tip of the stick up and down and you’re good to go! When it comes to turkey calls, Primos is a brand that both novice and veteran hunters trust. I love how they make their products from high-quality materials, assuring customers that they are getting their money’s worth for each purchase. From its lineup of impressive products, the Primos Hook-Up Magnetic Box Call is one of my favorites. It has a patented magnetic hinge design that creates realistic turkey clucks, purrs, and yelps, even for long-distance calling. And because of its magnetic hinge, you won’t have to worry about misplacing your paddle because it will automatically snap back into place. Just be careful not to get it wet because it tends to produce unnatural sounds once the magnets get moisture on its surface. Still, I think this is a good investment for beginner turkey hunters, especially for the price it’s selling for. I’ll admit it’s not my favorite design, but I still find that the Lynch World Champion Turkey Box Call has its own charm. For one thing, it has a unique two-sided construction that allows you to make not just hen sounds but gobblers, too. Each box is handmade, which I find adds a personal touch to the product. Wary about low-quality plastic materials? Don’t worry! This turkey box call from Lynch is made of straight-grain mahogany wood, so you can rest assured that it will produce natural and realistic sounds that plastic box calls can’t replicate. My biggest beef with this product is that its rubber bands get dry quickly so you may need to replace them with something more durable after (or even before!) your first use. It’s also a bit more expensive than other box calls, so you may want to consider your budget first before buying one. 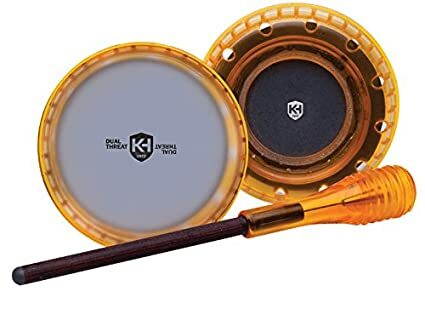 I seriously love Knight & Hale’s dual glass and slate turkey call. It’s like having the best of both worlds when it comes to a turkey call for beginners. Not only can you easily change surfaces as the need arises, you can easily produce different sounds because the striker is so easy to use. I definitely recommend getting this turkey call for your next hunting trip. One thing to remember, though, is that like most slate calls, the Knight & Hale Dual Threat & Slate Turkey Pot Call is a bit harder to use than the other two types of turkey calls. But with a little practice, I’m sure you would get the hang of it and use it effectively during your hunting trips. If you don’t mind doing a bit of hard work, I recommend investing in the Knight & Hale Dual Threat Glass & Slate Turkey Pot Call. It already comes in two surfaces, which gives you more options to change your calls depending on your hunting situation. It’s also designed ergonomically so it’s easy and comfortable to hold in your hands. If you want something a bit easier to operate, then I suggest going for the Primos Hook-Up Magnetic Box Call. Its magnetic hinge design assures you that you won’t lose your paddle in the middle of your trip, and it can produce loud realistic calls that even turkeys from far off spots can hear. Did this list help? 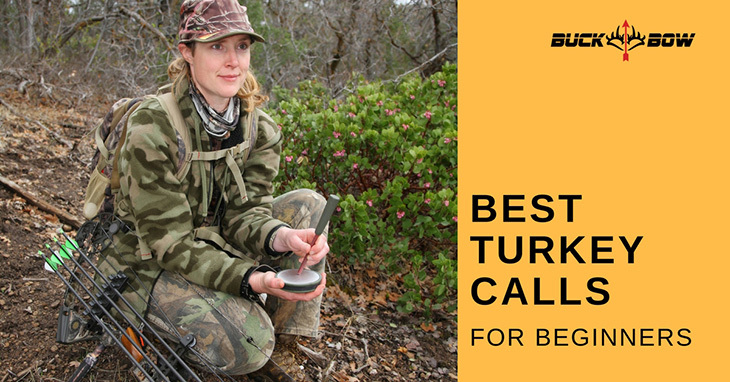 Do you have other recommendations for the best turkey calls for beginners? Let me know in the comments’ section below. Happy turkey hunting!